Today marks the third week of Secure Sense Crew Interview, a little q&a, so you can get to know the phenomenal technical and sales teams we have here! 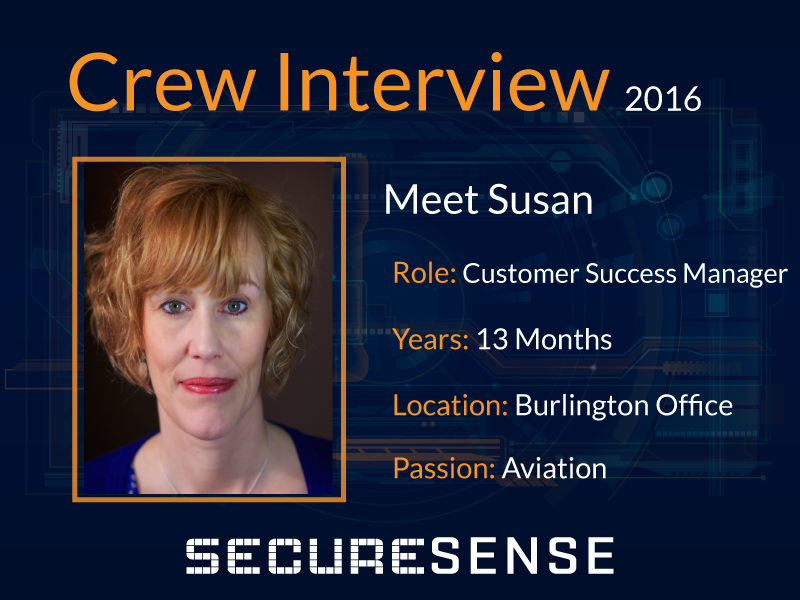 For our third interview, to show off our crew, we present to you the amazing Susan Singleton! I am the Customer Success Manager. I work as a liaison between Sales and the SOC and Networking team to implement projects and ongoing communication with our Managed Service Customers. I left the jewelry industry because I got hired at the new Sega of Canada. An awesome time for the gaming industry, I was hired initially as a Sales Coordinator and within a few months I was promoted to Merchandising Manager. For the first time I was engaged with customers directly and a part of their store planning for Game Interactives and displays. A fun first tech job, there was a VR racing game in the warehouse for break time and I acquired all systems that were hot at the time, Sega Genesis, Sega Saturn. I was lucky enough to attend Comdex in Las Vegas and met Actor Brent Spiner who played Data on Star Trek, many years ago (if I tell you exactly when I will reveal my age ;). I have an interest and drive to learn more about technology. Years ago I was a Product Manager for 11 lines of Technology including laptops, printers and other peripherals, I was training sales staff on many different products. I needed to learn and be able to translate product specification into something a Salesperson could use. I have been interested ever since. Even though I am not in a technical role, I need to understand the product and it’s capabilities. I am lucky I can always lean on our talented technical team if I need clarification on something. When I was in Sales in this industry, it was all about Firewalls, Intrusion Detection was new, URL filtering. The systems and requirements have become more complex, now we have SIEM’s required to handle the volumes of logs generated by many different internal systems. Security Infrastructure for many companies requires a large team to manage and requires experts like us to assist companies in their day to day operations. Complacency, there is no room in IT Security for this. You have to be improving and changing constantly in order to handle constant threats whether it be spam, phishing, or malware. Keep on up to date on hacking and security news and of what is happening in the industry. Also, ensure you are always patching and upgrading software and retiring old servers with out of date operating systems. Engage a third party to do a penetration testing, measuring how vulnerable you are. The people, some of the smartest, kindest and hardworking group of people I have ever worked with. Paris, France, I have always wanted to go and visit the museums.